The combination of drying and grinding with inertial separation allows to grind materials with initial humidity to 60% by weight. Impingement attack of rotor blades to material and multiple material particles collisions in dense velocity layer allow to grind coarse material particles efficiently. Rotor rotational velocity, depending on its model, is 2000 turns per minute. 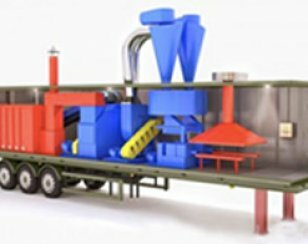 During grinding process simultaneous drying is executed, it doesn’t allow material to stick to operating apparatus surface. Applied inertial separation principle allows to take out particles of necessary size from grinding area under air flow. Material feed may be executed by different ways: by jet transport, by auger conveyer, by belt transporter. Material selection from air flow is executed with the help of specially developed whirler by SIOT, material is precipitated to bunker.